" I got in! He said that I have an amazing range – and sing a top A better than some of his Sopranos! Got a higher mark than last time and put in to semi-chorus. All down to you - Thank you for all your encouragement. " Thank you so much for being my singing teacher. I have loved having singing lessons with you - you have always made them really fun with your wicked sense of humour!.... Your encouragement and teaching has continued to fire my love of singing - and I know it is certainly something which I will carry on with! THANK YOU so much for being my singing teacher over the years. You have helped me develop not only my singing but also my confidence. I would also like to thank you for making the lessons so enjoyable. Thank you very much for all the help you've given me over the four years that you've taught me. When I first began, I think that I struggled to speak my mind aloud, let alone sing. I walked into the very first lesson timid and sceptical, of more than anything, myself, doubtful that anything would change. Only looking back now, I realise how different that girl is from me. I've learned a lot more than just being able to hit higher notes and being able to breath properly (I guess I had it wrong all these years!). I might not be able to stand up and suddenly belt out the chorus of Hallelujah in a room of strangers (not yet, at least) but I'll carry the confidence I've gained with me in every way I can. Maybe I'll even join a choir in University, or, if that fails, a band, maybe a Peruvian folk band. With team ponchos. Anyway, I'll finish off by saying how much I truly value everything I've learned. I got in! He said that I have an amazing range – and sing a top A better than some of his Sopranos! Got a higher mark than last time and put in to semi-chorus. All down to you - Thank you for all your encouragement. 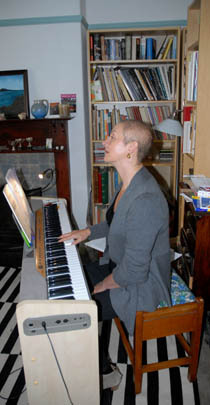 One of the most knowledgeable singing teachers in the country; worth venturing into Bristol just for a session with her. ... write back to Frith and try hook up some sessions. I met her on Saturday and within 7mins found her to be one of the most knowledgeable voice coaches I've ever met. Prioritise this over any other I've suggested thus far.